Hi everyone, i made this new wall of Gaara, i just focus on cleaning the image and put some effect's on the text. 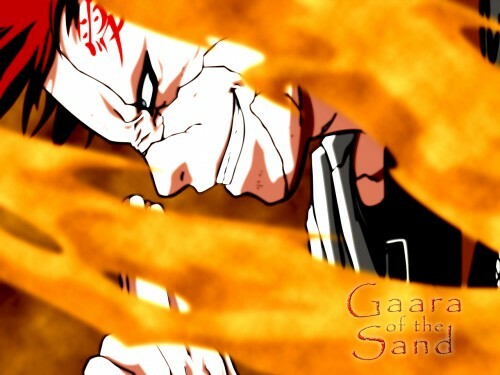 I hope Gaara fans like it .. ^_^. note: I delete the previous one cause i had to move the text a little bit up .. LOL. Thats cool, I love that crazy expression on his face. It's so psychotic. The colors are crazy, it really jumps out at you, I find, Anyways, good job! Awesome work!!!!!!! And please....the colours ..man you are genious. Thanks a lot! hihihi ... Gaara est en trin de se marer, le sadique !!! il est trop beau se fond d'ecran ... dans mes favoris !! !